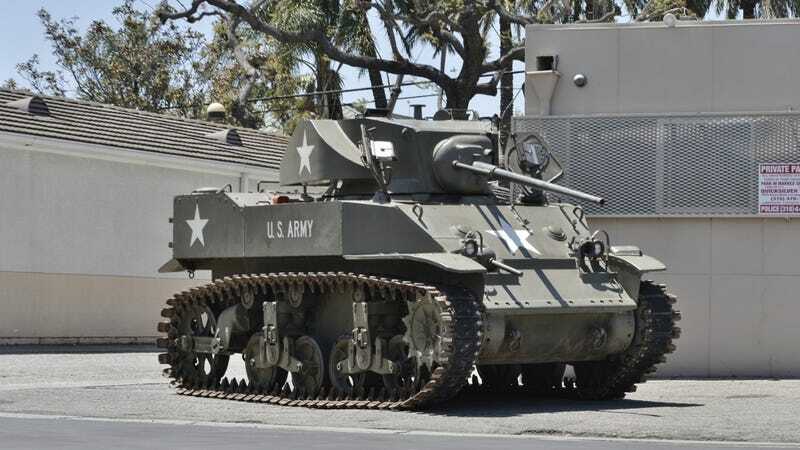 Listed on car auction site Bring A Trailer, this 1944 M5A1 Stuart first caught my eye this morning as I was weighing my gold in the vault. I got the message on my phone and immediately dropped it in surprise. A servant handed me another because I don’t like picking things up. “It’s perfect!” I exclaimed, scrolling through the pictures. The tank, I learned after having the listing read aloud to me by a kidnapped Elvis impersonator, had apparently been sent to Europe late during World War II. Presumably to go do tank things. But now it’s back in the U.S.
Demilitarized, LOL. That won’t be a problem at all. I can fix that in a jiffy and have it back to leveling private homes in no time. And probably add a few more guns of my own. Like a railgun jury-rigged to the top. Who says we can’t try? Anyway, with the primary hull armor being 2.5 inches thick, I think it’d be perfect for navigating Manhattan traffic. I know I said before that I couldn’t just drive down Park Avenue in a tank, but then I realized that I haven’t actually tried it before. Ask for forgiveness and not permission and all that. Besides, all city officials have a price. Parking is always a nightmare, traffic is terrible. This easily solves both of those problems because no one ever thought that driving over the problem was a perfectly viable solution. And once you flatten the problem, is it even a problem anymore? If he doesn’t, he’s a fraud. I Just Won $759 Million! What Cars Should I Buy?